As seen from mid-northern latitudes on Wednesday, March 30, the waning crescent moon and the blazing planet Venus will be sitting low over the eastern horizon, starting around an hour before sunrise. Any obstructions – such as trees or houses – might block your view of Venus. The moon will be easier to spot because it will be higher up in the sky. Venus is the third brightest celestial body to light up the heavens, after the sun and moon, but it is low in the east on these March mornings. The farther north you live, the more difficult Venus will be to catch. The farther south, the easier. For instance, at far northern latitudes near the Arctic Circle, Venus will rise at about the same time as the sun. At mid-northern latitudes, Venus will rise about 75 minutes before sunrise. At the equator, Venus will come up a solid 2 hours before sunup. In addition, at middle latitudes in the southern hemisphere, Venus will rise 3 hours before the sun. Everywhere worldwide, the moon will come up before Venus tomorrow morning. 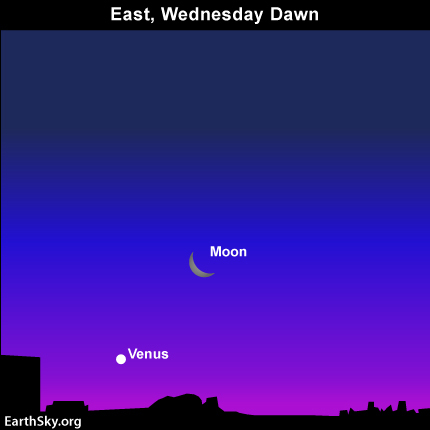 Then Venus will follow the moon above the eastern horizon. Once again, the moon will rise at an earlier hour at more southerly latitudes. So why will the moon and Venus rise sooner before sunrise in the southern hemisphere? It is because it is early autumn in that part of the world. In addition, on early autumn mornings, the ecliptic –the pathway of the moon and planets – hits the horizon at a particularly steep angle. However, it is now early spring in the northern hemisphere, and on these early spring mornings, the ecliptic intersects the horizon at a shallow angle. That’s why the waning crescent moon and Venus will be tougher to spot in the morning sky on March 30, 2011 as seen from the northern hemisphere than in the southern hemisphere. Site contents copyright © 2019 Recorder Online	except as noted. All rights reserved. | 88 queries in 2.082 seconds.